The summers of 2011 and 2012 were significant in terms of Carter Lake development and change. The most memorable event of 2011 was the record level flooding along the entire Missouri River basin. From the end of May through the end of August, the Missouri River remained at or near historic highs for both water level and water flow through the entire system of dams managed by the Army Corps of Engineers. While a heroic effort by the Corp and the City of Omaha prevented breaches in the levees surrounding Omaha and Council Bluffs, the water pressure was sufficiently high to cause massive ground water seepage into Carter Lake. It was estimated that the flood control pump in Carter Lake removed twice the normal volume of water in the lake during the summer. 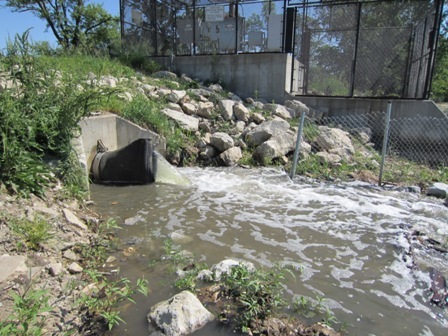 While there was no immediate flooding in the area, the result was a continuous influx of fresh, clear groundwater into the lake. Combined with the fish kill and alum treatments by the Iowa and Nebraska Departments of Natural Resources the year prior, Carter Lake recorded some of the clearest water ever seen at the lake. Clarity of depths to 20 feet and beyond where measured -- which rivaled the quality of deep, fresh water glacial lakes, such as Lake Okoboji. While looking pristine, the downside of the clarity was an explosive growth of lake weeds and vegetation that virtually choked most of the lake and brought an end to most boating activities throughout the summer and fall of 2011. After the flood threat passed and the river returned to normal levels in the late Fall, the level of the lake gradually fell and the influx of groundwater stabilized. A gentle winter followed and by the end of January, the lake was mostly ice-free. The Spring of 2012 was mild and the lake continued to warm at an above average pace. 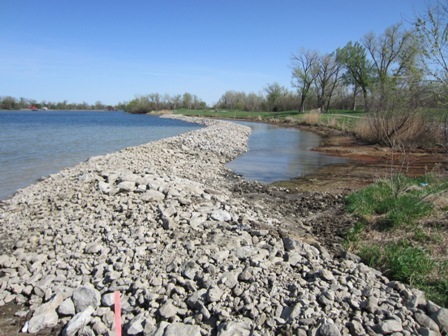 This was beneficial from the standpoint of lake improvements: the warm weather allowed the contractor hired by the states’ DNRs to begin work on shoreline and inlake improvements. Structures such as fore bays, jetties, and riprap were installed around the lake, creating wildlife sanctuaries, fishing access and stabilizing the bank from further erosion. The work was focused primarily on the West, North, and Eastern shores of the lake and by the end of the Summer, 2012 the contractor had finished all of the shoreline improvements. The 2012 Carter Lake Preservation Society Annual Lake clean-up was held on Saturday, April 21. Approximately 63 people showed up to help with this annual event, which began with the first clean-up in September of 2005. Despite construction around the lake, the volunteers were able to clean about 75% of the total shoreline. Items picked up consisted of bottles, cans, litter and other assorted trash (including seven, 55-gallon barrels) that had accumulated over the last year. Unlike 2011 when water levels were high, the lower lake levels this year allowed the clean-up teams better access to the shorelines. On Wednesday, May 16, 2012, a significant milestone occurred in lake restoration history. At that time, the lake recharge system was turned on for the first time and water began flowing into the lake from a well located near the Missouri river. This project had been several years in the making. In July of 2008, after 2 years of intensive planning and lobbying, the State of Iowa appropriated approximately $500,000 for the construction of the Carter Lake recharge well. With funding in place, the cities of Carter Lake and Omaha worked together to plan, implement and build the recharge system over the following 4 years. The system finally came online on May 16th and is now capable of pouring clean ground water into the lake at a rate of 2500 gallons per minute. At that rate, it is expected to take approximately 30 days to raise the level of the lake 6 inches, allowing for normal evaporation. The Summer of 2012 was exceptionally dry – but with the pump in operation, Carter Lake water levels held steady. 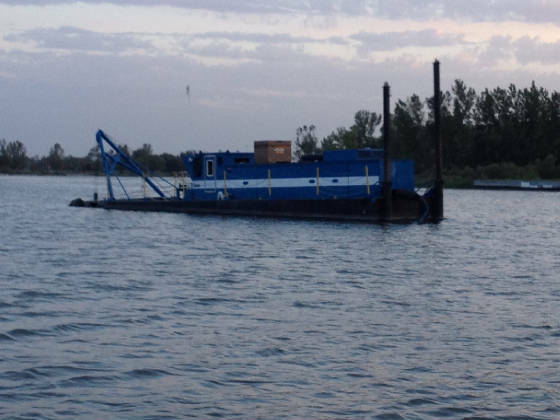 In June, a dredge operator was hired and work began to remove approximately 88,000 cubic yards of silt that had built up over the years in the Northeastern section of the lake. The dredge continued to operate well into the Fall, deepening that part of the lake by several feet. The spoils were pumped into holding lagoons constructed in Levi Carter Park. The solid materials settled out and remained in the lagoons while the clean water drained back into the lake. It was also during the Summer that action was initiated to control the weed infestation problems that developed during the previous summer. Without the extraordinary inflow of fresh groundwater seen in the Summer of 2011, the clarity of the lake began to return to more normal levels. However, residual weeds continued to clog the canals and most of the lake, jeopardizing yet another year of boating activities. The City of Carter Lake continued to operate the lake weed cutter as it had done the previous year in an effort to reduce weeds in the canals and along the lake front. The Iowa DNR also addressed the problem when it applied an aquatic herbicide to areas of the lake that were going to be dredged. Realizing that weeds were going to remain a significant problem, the DNR then allowed lake residents to obtain a special permit to have approved chemicals applied by licensed applicators to specific parts of the lake. The Carter Lake Preservation Society joined efforts with several Homeowner Associations and the Silverhawk Ski club to have all of the canals areas and ski course areas treated with the herbicide. CLPS coordinated the project with the contractor and contributed one-half the cost of the application along with each of the HOA’s and ski club. Within 2 weeks, the treated areas were clear of weeds. Realizing the success of the program, the Iowa DNR then treated approximately 60 additional acres of the lake to further remove the problem weeds and to open more areas of the lake for boating. With the pump maintaining water levels and the clarity of the water returning to a more balanced state, boating improved and the weed levels of the lake were significantly decreased. Going into the Fall and Winter of 2012, we have seen a large part of the Carter Lake Improvement Plan implemented by a number of agencies and departments from Nebraska and Iowa and the Federal government. Approximately 6 million dollars already has been spent or is earmarked for the entire project, including funds for lake improvements, shoreline stabilization, fish repopulation, and water quality improvements. The recharge pump is yet another lake project that was successfully implemented in 2012 after years of lobbying, planning and construction. Challenges still remain 2013 and beyond for the lake with weed, water clarity, and water quality issues – but considerable progress has been made over the last year, in particular. Just look around the lake and you’ll see the evidence of that progress!